Dr. Erin Hodgson is an Associate Professor and Extension Entomologist at Iowa State University. She received her undergraduate training in Biology and Botany and her M.S. in Entomology from North Dakota State University. Erin was awarded her Ph.D. in Entomology from the University of Minnesota, followed by a postdoctoral research position also at the University of Minnesota. Erin served on the faculty at Utah State University before joining the faculty at Iowa State where she is today. Erin has received many awards and honors in her career, including the Editor’s Choice Award from the Journal of Soil and Water Conservation, the Iowa State University Outreach and Extension New Professional Award, and multiple awards from the Entomological Society of America for her educational and outreach efforts. In addition, Erin is co-host of the “Soybean Pest Podcast” with her colleague Matt O’Neal. Erin is with us today to tell us all about her journey through life and science. Erin spends her free time outside enjoying the company of her husband and two dogs. She is also an Assistant Coach for the Iowa State University Women’s Rugby Club and dedicates a lot of her time in the evenings to helping coach the team. Erin is an extension entomologist who specializes in insects in agriculture, often focusing on corn and soybean crops. Extension work, where she translates practical science related to insects, makes up about 70% of her job. In this role, Erin works with people like farmers, crop consultants, people in the agricultural industry, regulators, and people in pest management to best manage insect pests in an agricultural landscape. Though Erin didn’t grow up in a particularly scientific household, she was always interested in science classes in school. To her, science just seemed more interesting and sparked her curiosity more than other classes. Erin’s interest in insects began in college after taking her first entomology class. This, combined with a serendipitous advertisement for a master’s degree program in entomology, led her down this exciting career path. Corn is a major crop in Iowa, and there is a pest called rootworm that can be devastating to crop yields. A product created in 2006 to deal with this pest was initially highly effective. However, soon afterwards, the product started to break down. Erin had the difficult job of communicating to farmers that this was not the hands-off, easy solution they had been hoping for. Pushback from industry and farmers against her research findings can be a challenge in Erin’s position. As a graduate student, Erin was one of the first people in North America to work on soybean aphid. She developed an innovative sampling plan for soybean aphids called Speed Scouting for Soybean Aphid. This sampling plan helps farmers decide within 15 minutes whether they need to treat their plants for pests or not, without having to wade through acres of their fields to look at each plant. Her sampling plan is currently being used to help many farmers today. This past year Erin had the opportunity to serve as co-instructor for the Iowa State Tropical Agriculture class. As part of the course, the class travels to Costa Rica over spring break. Erin was delighted to see agriculture outside the US for the first time. They visited a variety of small and large scale farms growing everything from coffee to pineapples. The freshly picked pineapple was exquisite, and she was fascinated by the demonstrations on coffee ratings. Erin and her colleague Matt O’Neal work together on a lot of projects, including their “Soybean Pest Podcast” series. At work they share resources, space, and summer research students. They have developed a fun tradition of hosting a BBQ party at the end of the summer to celebrate the end of the summer field season and all the hard work of their students. They have a fantastic time playing lawn games like volleyball, softball, and corn hole. Always be curious, ask questions, and listen. Make sure to be open to opportunities and collaborations in science. Erin is originally from North Dakota, and is currently an extension entomologist and associate professor at Iowa State University with a specialty on field crop insects. She has a general background in IPM (Integrated Pest Management), where she develops tactics to improve corn and soybean production in the Midwest. Her extension and research programs are focused on improving profitability, sustainability and environmental stewardship of agriculture. Erin enjoys communicating with social media (e.g., twitter, videos and podcasting) to reach new audiences. 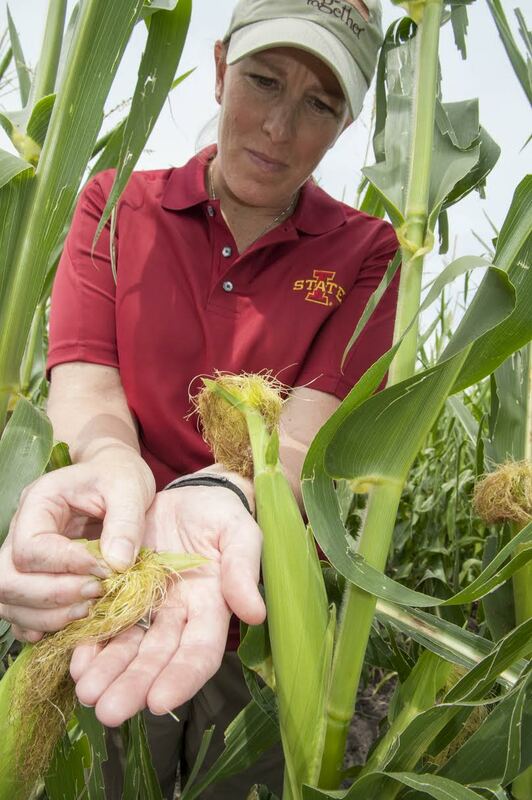 Recently she became the Crops Team Leader for Agriculture and Natural Resources, which is a large group of extension faculty and staff at Iowa State University. In her free time, Erin enjoys photography, reading, crochet, crafting with paper/metal/paint, hiking with her husband, playing with her two dogs and hanging out with family. She also helps coach the ISU Women’s Rugby Club and coordinates an exercise group in Ames.